The report by the Joint Committee on Legislative Ethics details abusive behavior going back to 2015 and continuing through this year. The investigation was extensive, Baltimore Del. Samuel Rosenberg, House chair of the committee, told the House on Wednesday. Staff conducted 38 interviews, 18 people gave sworn testimony at a hearing over the weekend, and the committee reviewed supporting documents. “We learned of a pattern of verbal abuse and controlling and belligerent behavior, especially with staff that Del. Jalisi considered subordinate to him,” Rosenberg said. Several times over the years, House Speaker Michael Busch and other delegates advised Jalisi to change his behavior, according to the committee’s report. “Regretfully, he ignored their advice and their attempts to help him change his conduct and has continued to engage in abusive and bullying behavior,” Rosenberg said. The report says Jalisi told an aide to work 100 hours of overtime but refused to approve the aide’s timesheet afterward. He reprimanded staff for going to the bathroom or to get lunch, and he belittled them for their performance. When the legislature was on a liberal leave status, with most hearings canceled due to bad weather, Jalisi forbade his staff member from leaving. According to the report, he “verbally abused, bullied and was belligerent” with Ethics Committee staff members, and an argument with staff in the House Clerk’s Office prompted the clerk to ask a state trooper to keep Jalisi out of the office. These incidents led to warning letters from the Ethics Committee and several conversations with House leadership. “Last year, the speaker required him to complete a course in anger management and workplace civility. If he did not complete the counseling, he was told, Del. Jalisi would not be able to have staff paid for by the General Assembly,” Rosenberg said. But Jalisi did not complete the training, and yet he retained his staff. In January, the staff members were told they could move to different jobs in the legislature or else lose their pay. Jalisi said he has four part-time staff members who chose to stay on without pay out of loyalty. One of them is Nina McHugh, who said she has worked for Jalisi for more than two years. Jalisi denies all of the allegations in the committee’s report. “The whole report is more about my style and not about substance,” Jalisi said. “Somewhere there's a reference about me asking somebody to finish their work and not go home until the work is finished. I mean that's why we are here." Jalisi and McHugh both said the report and the resulting reprimand are a political attack. But House Majority Leader Kathleen Dumais, who sits on the Ethics Committee, said the committee voted unanimously in favor of reprimanding Jalisi only after a meticulous investigation. Jalisi said he will likely attend the anger management training this time, but not because he agrees that it’s necessary. He wants his staff to be paid. 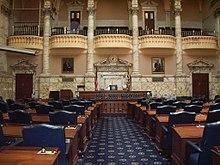 The House of Delegates voted Thursday to censure Del. Mary Ann Lisanti, whose district is in Harford County, for her use of the n-word. The Democrat was heard using the slur to describe a district in Prince George’s County during an event at a cigar bar in Annapolis in January.